We’ve previously discussed the cost and automation benefits of deploying multiple websites to a single AWS instance using TeamCity and Octopus Deploy which is a great combination for managing production website deployments, taking advantage of the automation capabilities of TeamCity and the release management features of Octopus Deploy. There’s an even simpler option for deploying multiple ASP.NET Websites to a single AWS instance which can be initiated directly from within VS.NET (i.e. without needing any external TeamCity and OctopusDeploy services) by using VS.NET’s built-in Web Deploy tool. In this tutorial we’ll walkthrough 2 different approaches for deploying websites using either VS.NET’s Publish Web Deploy wizard or alternatively using a Gulp Task which is better suited for deploying Single Page Apps requiring any necessary pre and post processing packaging and deployment steps. For a concrete example, we’re going to be using an AWS EC2 instance running Windows Server 2012 with IIS installed. To enable Web Deploy, a package needs to be installed on the server so you will need a few things to get started. While here, you will also need to add a new security rule for Web Deploy to work. It uses port 8172 by default. If you are missing HTTP and HTTPS, ensure these have been added as well. Now we can remote into your instance via RDP. Amazon has some detailed documentation about how to go about this, but basically you will need the address of the server, username and password. 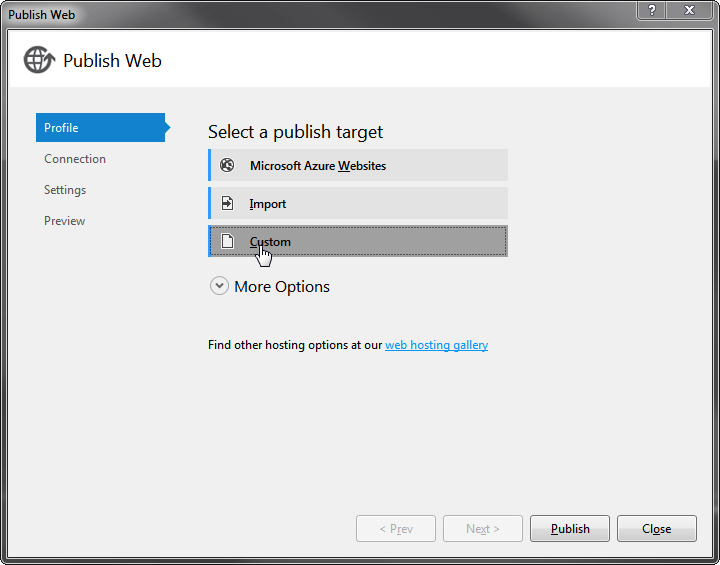 Once connected, you’ll want to copy across the Web Platform Installer to enable the Web Deploy feature to work on IIS. 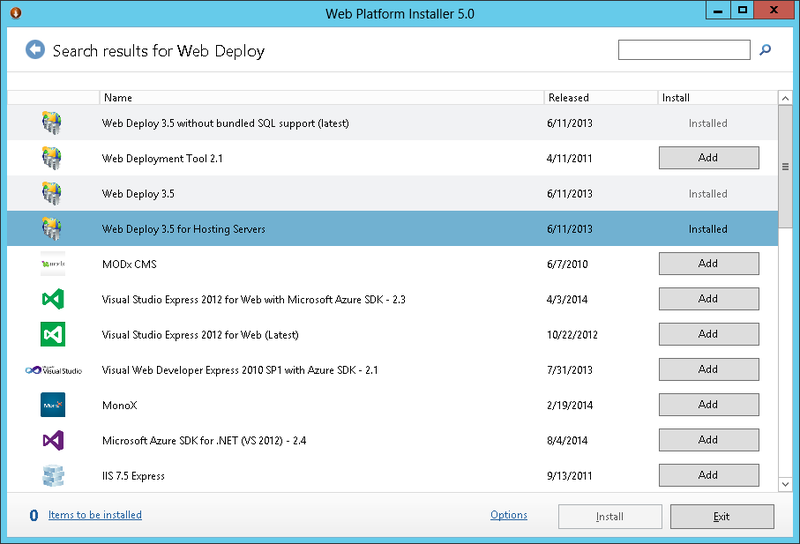 Run the web platform installer and search up the top right for Web Deploy and one of the results should be Web Deploy 3.5 for Hosting Servers. Click Add and then Install at the bottom right. Once installed, we now have to create an IIS web site as our deployment target. Open the IIS Manager, right click on Sites, select Add Website… and provide the appropriate information for your web site such as the domain name. Record the name of your website as we will need this later. With the remote server setup to accept Web Deployed applications, we can create an application to deploy. 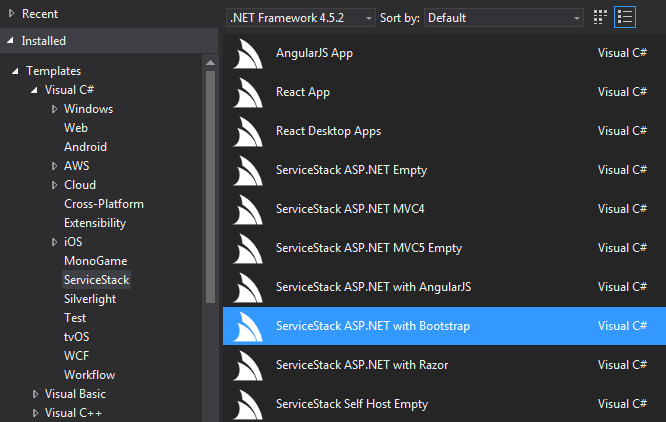 For this example, we are going to use the ServiceStack ASP.NET with Bootstrap template from ServiceStackVS. This will create a simple HelloWorld application that we can use to test our deployment. The next screen will require your EC2 Public DNS name that can be obtained via the AWS management portal for your instance. Also, the site name we created earlier needs to match. You will also be required to provide a username and password of an account that has sufficient permissions to publish your application. 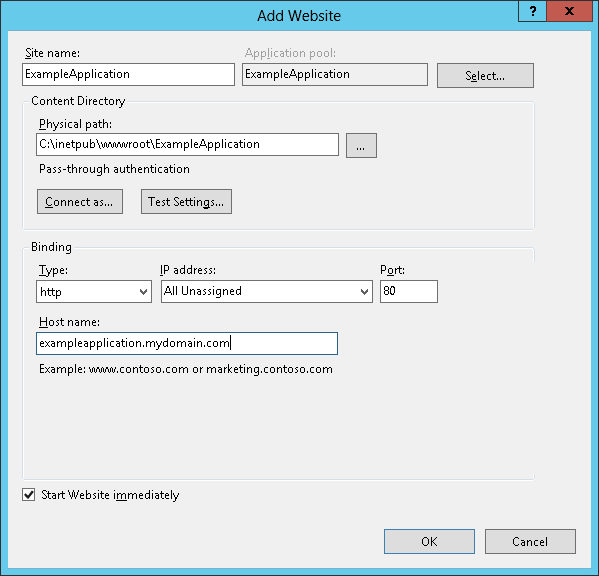 An administration account has sufficient permissions, alternatively, there is an article on Installing and Configuring Web Deploy on IIS 8 that explains this in the section titled Configuring a Site for Delegated Non-Administrator Deployment. 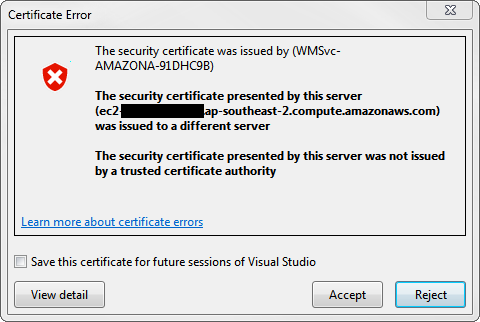 You may get the following warning about certificate presented by the server, if you haven’t setup the server with the appropriate certificates you can still continue. 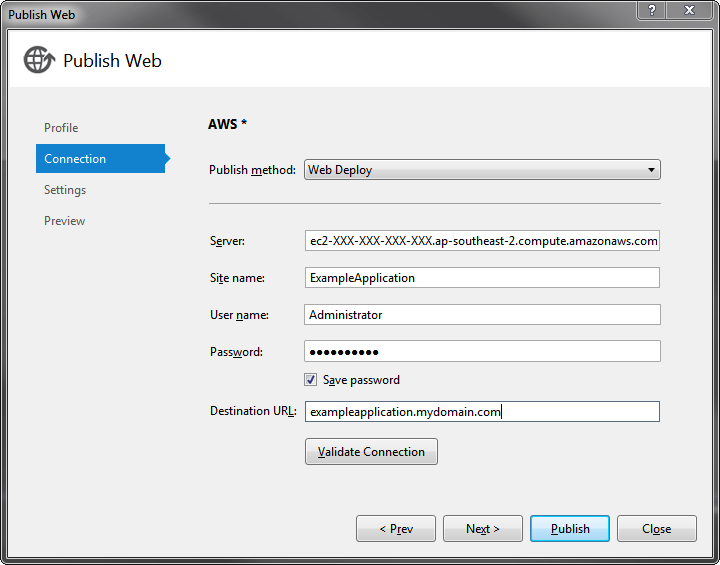 Once Publish has started, this will build your application and push the files using Web Deploy. The first deployment might take some time due to having to copy all files required by the application to run, but subsequent copies only update the files that are different, making this a very quick way to update and present the progress of an application on a development server. Although the Publish wizard is a great tool, by default, it doesn’t work well with single page applications like AngularJS where the client side of the application that requires pre/post processing of client side scripts and assets. Another way to publish still using Web Deploy (msdeploy) is by using a Gulp task. The Gulp task simply wraps msdeploy using the gulp-msdeploy Gulp package (base on grunt-msdeploy written by Jack Davis). If we create a new project using the AngularJS App template from ServiceStackVS, we can modify what is already there very quickly to get our application to deploy to our AWS instance. Once filled in, we can run the provided tasks 2 and 3 to package our application and task 4 to deploy it. If you are running Visual Studio 2015 (or 2013 with extension), these Gulp tasks can be very simply from Task Runner Explorer UI. Even though by using GitHub’s default Visual Studio .gitignore the config will not turn up in source control, the password is still stored in plain text. This should be taken into account when deciding if this method of deployment is suitable for your development/deployment environment. This template is also taking care of optimizations like CSS and JS minification in the packaging steps. Package of the server files and client files separately enable us to update and deploy an optimized client side version of our application quickly as only our client side resources will have to be updated.